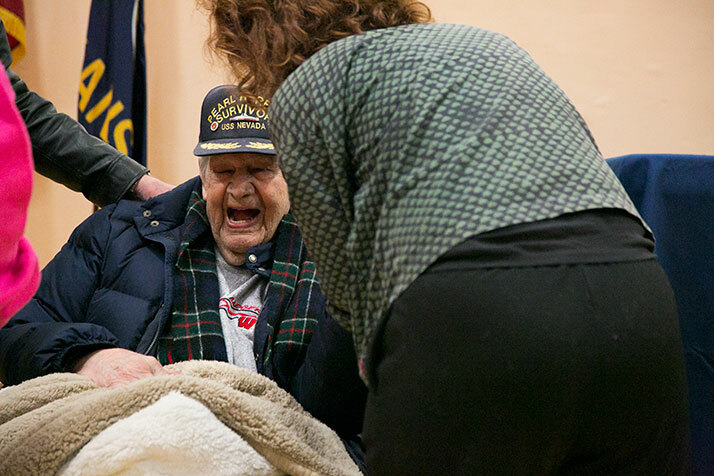 Dorwin Lamkin sharing a laugh at the 2016 Pearl Harbor ceremony in Mission. Dorwin Lamkin, the Navy veteran who was a driving force behind the creation of Pearl Harbor Memorial Park in Mission, died Sunday at the age of 96. Lamkin, who was serving as a corpsman on the USS Nevada on Dec. 7, 1941 was the last survivor of the Pearl Harbor attack in the Kansas City area. 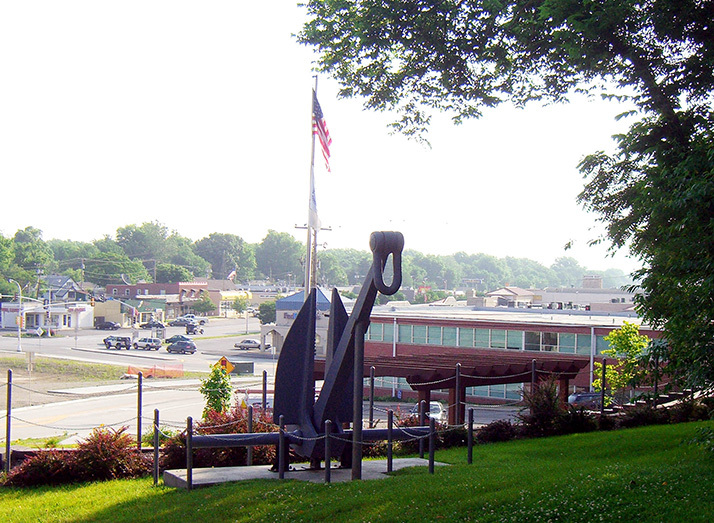 Mission’s Pearl Harbor Memorial Park, dedicated in 2004. Born in North Hudson, Wis., in 1922, he joined the Navy the day he turned 18. After Pearl Harbor, he was transferred to the USS San Francisco, serving during the height of the war in the Pacific theater. He saw the battles of Tarawa, the Marshall Islands, Saipan, Tinian, Guam, Iwo Jima and Okinawa. After the war, he attended the University of Kansas, where he played both offense and defense for the Jayhawks football team. He was part of the team that made it to the 1948 Orange Bowl. Lamkin spent much of his career with Upjohn, where he worked in sales roles for 23 years. He then moved on to Simplex, a mechanical equipment company, where he stayed until his retirement in the mid-1980s. Lamkin was president of the Metro III Chapter of the Pearl Harbor Survivors Association. As a Mission resident for decades, he was a leading force in the effort to create the Pearl Harbor Memorial Park at Martway and Maple, which was dedicated in 2004. Lamkin was also a prominent presence in the annual Pearl Harbor memorial service put on by the city of Mission each year. In December 2017, Rep. Kevin Yoder used time at the podium in the House of Representatives to recognize Lamkin for his service in the Navy and for his work to commemorate survivors of the attack through the annual ceremony. He met his first wife Katherine Gorrill during his time at KU, and the couple went on to have four sons. Katherine was killed in a hit-and-run accident in 1968. In 1969 he met Nora Bridges Cowan, who became his second wife. Nora died in 2001 after a diagnosis of Alzheimer’s disease. He is survived by daughter Susan Cowan, Overland Park; and sons Scott Lamkin, Lawrence, ; Calvin Lamkin, Farmersville, Texas; and Peter Lamkin, Fairfax, Calif.; five grandchildren and many great-grandchildren. The family will hold a visitation and memorial service from 6 to 8 p.m. on Thursday, March 21 at Amos Family Funeral Home, 10901 Johnson Dr., Shawnee. There will be a picnic and burial service at noon on Saturday, May 4 at Ridge Park Cemetery in Marshall, Mo.